Former Northern Ireland Under-21 'keeper and winner of Sky TV's Premiership Save of the Season in 2003/04, can Alan Blayney live up to his potential? Representative Honours: Northern Ireland: 5 Full Caps (2006-2011), 1 Under-23 Cap (2004), 5 Under-21 Caps (2002-2003). Club Honours: (with Linfield) IFA Premiership Champion 2009/10, 2010/11, 2011/12; Irish Cup Winner 2009/10, 2010/11, 2011/12; (with Ballymena) Co. Antrim Shield Winner 2015/16. Awards: Ulster Footballer of the Year 2010/11. In January 2007 Blayney's Doncaster contract was cancelled by mutual consent. He signed for Oldham the following month after a brief trial. As of May 2007 he was a free agent. He signed with Eircom League side Bohemians in August but was released at the end of the campaign. On 15 March 2008 it was reported that Blayney had signed for Ballymena United, but would be unable to play until the following campaign as he had been signed outside of the transfer window. 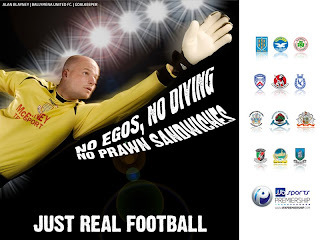 On 1st of June 2009 Blayney made a long-speculated transfer to Linfield as replacement for another international, Alan Mannus. After a difficult start at Windsor Park he aided Linfield to "The Double", pulling off a few excellent saves in the 2-1 Irish Cup final win over Portadown, but also earning criticism for letting the ball slip through his hands for the Ports goal. For many the performance summed up his career to date - calamitous one moment to world class the next. 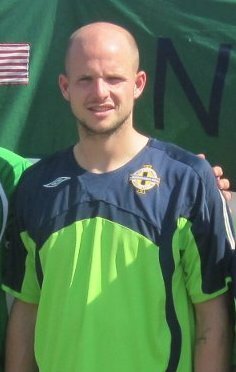 Blayney was called into the Northern Ireland squad for the first time in four years following the withdrawal of Alan Mannus from the summer 2010 Americas tour. He started both matches of the tour and retained his place in the squad at Mannus' expense at the start of the following season. An appearance from the bench in a friendly against Morocco saw Blayney concede an embarrassing goal as his clearance rebounded off an opponent to give the Africans the lead. Clearly rattled, he struggled to maintain his composure for the remainder of the game though his blushes were somewhat spared as Rory Patterson equalised through a late penalty. Blayney helped Linfield clinch a second consecutive title, making a total of fifty, in May 2010. His performances through the following season dispelled doubts of his ability, and he was lauded as among the Premiership's players of the season. He capped the campaign as captain of Linfield's Irish Cup winning side as a second consecutive Double was completed and by claiming the Ulster Footballer of the Year award. In May 2011 Blayney shared goalkeeping duties with Jonny Tuffey as an inexperienced Northern Ireland team endured an embarrassing Carling Nations Cup. Although left exposed by a threadbare defence, Blayney was culpable in at least two of the Republic of Ireland's goals in a 5-0 defeat. At the start of the following season Mannus was recalled as Blayney's replacement in the Northern Ireland squad. With Linfield, Blayney continued to rack up the honours until the signing of Jonny Tuffey in 2013 saw him fall from the first-team reckoning. In January 2014 he joined Ards on loan but couldn't help them pull away from bottom spot and relegation back to the Championship One. He then agreed a move to Glenavon for 2014/15. He lasted just a year at Mourneview and was allowed to return to Ballymena with Tuffey once again coming in as his replacement. After a successful two seasons with Ballymena, Blayney's position came under pressure, firstly from Ross Glendinning then new signing Tim Allen. Ultimately Blayney was released in January 2017 and subsequently dropped down to the Premier Intermediate League with Dundela. Summary: 4(1)/0. Won 0, Drew 1, Lost 4. Goals Conceded: 11. Clean Sheets 0. Summary: 3(2)/0. Won 3, Drew 0, Lost 2.